A man has been stabbed in the chest during "large-scale trouble" involving hundreds of fans at West Ham's Carling Cup match against Millwall. Fights broke out at 1800 BST and were still raging five hours later. A 44-year-old man is stable after being stabbed in Priory Road at 2025 BST. A Metropolitan Police spokesman said missiles had been thrown at officers but none were injured. Inside Upton Park stadium West Ham fans invaded the pitch three times. 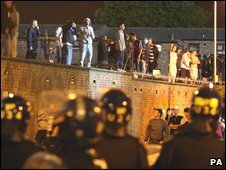 By 2300 BST several hundred West Ham fans had congregated outside the stadium chanting and bombarding police with crates and bottles. The first pitch invasion was after West Ham's equaliser, while the second more serious invasion happened after they scored a penalty. It took officials about six minutes to clear about 50 people from the pitch and police had to redeploy within the stadium to tackle the invasion. West Ham won the game 3-1 after extra time, upon which there was a third invasion by hundreds of fans. About 200 riot police and at least 20 mounted officers were at the ground and a police helicopter circled the area. The Press Association quoted an unnamed 19-year-old saying he saw a police officer being kicked on the ground. The police spokesman said: "There is large-scale trouble involving hundreds of fans which we are dealing with at the moment. "Officers are now containing it but there is still disorder. Hundreds of fans are estimated to be involved." One pub reportedly had its windows broken by bricks during running battles across several streets up to half a mile from the stadium. Eyewitnesses told of hooligans trying to rip out bollards and lighting "small fires". Five arrests have been confirmed, including one for affray and one for breaching a banning order. BBC radio reporter Ben Jacobs, who was at the stadium, said: "The trouble broke out outside the Tube station about 600 yards from the ground. "There were [hundreds of] riot police and Millwall fans managed to break through the divide." Tony, a steward at the game, told BBC Radio 5 live they were powerless to stop the violence. He said: "When you have 2,900 Millwall fans it is really intimidating. "There is not a lot you can do - you have to hope the police presence can help you out." A 29-year-old man had to close his kebab shop in nearby Green Street for two hours. He said: "All hell broke loose - it was very frightening. "Bottles and bricks were being thrown from the back and some were hitting West Ham fans at the front. "There were loads of people with bloodied faces." Aaron Smith, from Hemel Hempstead, who was at the game, said: "I saw one man cornered by at least a dozen Millwall fans before kick-off. Terrifying scenes." And a Millwall fan told the BBC: "It was like a war zone outside the stadium. There was fighting all round. "I brought my kids with me tonight and they've seen some violence that is indescribable." A Football Association spokesman said: "We absolutely condemn the disorder. "We expect all culprits to be banned from football for life - they have no place in our game."